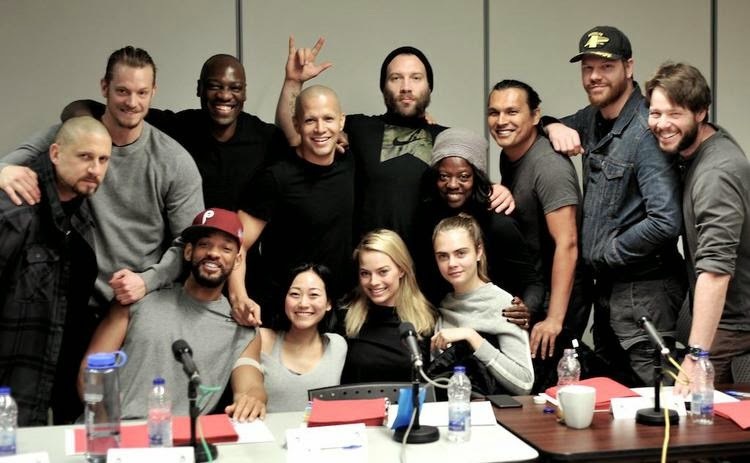 Suicide Squad director David Ayer shared a photo of the cast from their first table read on his Twitter account on Wednesday. In attendance were actors we already knew were attached - Will Smith, Margot Robbie, Viola Davis, Joel Kinnaman, Jai Courtney, Cara Delevingne, Adewale Akinnuoye-Agbaje, Jay Hernandez and Karen Fukuhara. There were also three new additions no one knew about. Jim Parrack (Battle: Los Angeles, Fury), Adam Beach (Flags of Our Fathers, Cowboys & Aliens), and Ike Barinholtz (The Mindy Project, Neighbors) also appear in the photo but they hadn't been previously mentioned so their roles were unknown. However, thanks to the snooping prowess of Latino Review's Umberto Gonzalez, who's been all over the casting of the film, revealed on Instagram that Parrack is playing Deathstroke. Joe Manganiello was the frontrunner for the role but for some reason could not come to terms with the studio. Beach is rumored to play martial artist Ravan and Barinholtz was picked to play Dr. Hugo Strange. Visibly absent is Jared Leto who plays the Joker. There were many theories thrown around the internet as to why he wasn't pictured, but I'm sure there was a good reason. Perhaps he's already looking like the Joker and didn't want to spoil it. Also not seen was Jesse Eisenberg who reportedly will play Lex Luthor but no one seemed interested where he was. The action thriller based on the DC Comics comic book series of imprisoned supervillains enlisted by a government agency to take on dangerous missions for reduced sentences is due in theaters on August 5, 2016.